IRS income verification service is an efficient, cost effective way to retrieve all IRS tax transcript forms: 1040s to 1099s, W2s, state income reports, and business income tax returns. The tax transcript provides a complete picture of all household income including investment income, as well as salary and wages. The 4506-T is one of the best defenses against the falsification of income tax returns. Triverify makes the process swift and simple, giving our clients the essential information they need as quickly as possible. As a registered e-Services member with the IRS, TriVerify provides transcripts through the Income Verification Express Service program to confirm the income of a borrower during the processing of a loan application. The IRS provides TriVerify with tax return transcript, W-2 transcript and 1099 transcript information within approximately two business days (6 a.m. to 2 p.m. Pacific time) with the taxpayer’s consent from a Form 4506-T or Form 4506T-EZ. This service expedites the transcript process by replacing the need for manual pick-up and delivery of transcripts from the IRS. Day 1 Certainty Approved! 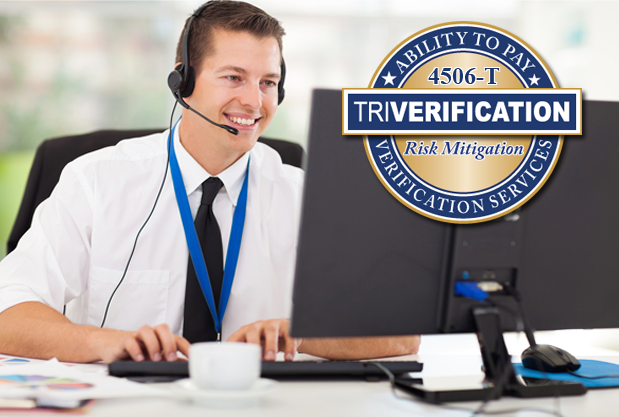 : All 4506T orders process through TriVerify are Fannie Mae Day 1 Certainty approved. Paperless Custom E-signature Solution: E-signature options create a paperless process that virtually eliminates rejection rates and streamlines consumer authorization. Expedite Processing Time: TriVerify’s thorough Form 4506-T QC check allows for tax transcripts to be electronically delivered within 24-48 hours, depending on IRS turn times. QC Review Process: The QC review process catches orders that could potentially be rejected by the IRS, resulting in cost and time savings. Risk Mitigation: As a neutral third-party, TriVerify delivers accurate income data directly from the IRS to uncover income misrepresentation. New upgraded system allows for ordering of multiple transcripts on one order (e.g. W2 & 1040) and is capable of ordering for multiple borrowers at a time. We are currently seeing 4506-T transcripts returned from the IRS for orders that were submitted within the last 48-72 hours.